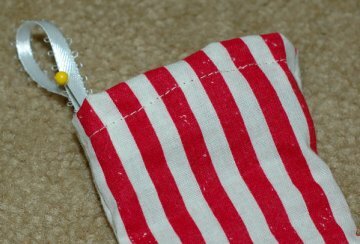 Sew an Easy Christmas Stocking. The first step to sew an easy Christmas stocking is to draw a pattern. 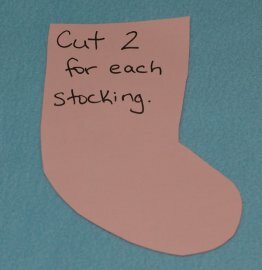 On a piece of cardstock draw a mini stocking. Use a pencil and experiment until you get the size you'd like. Don't make it too small or skinny or it will be hard to sew. Use your Christmas stocking pattern to cut out your fabric. You'll need two for each stocking. 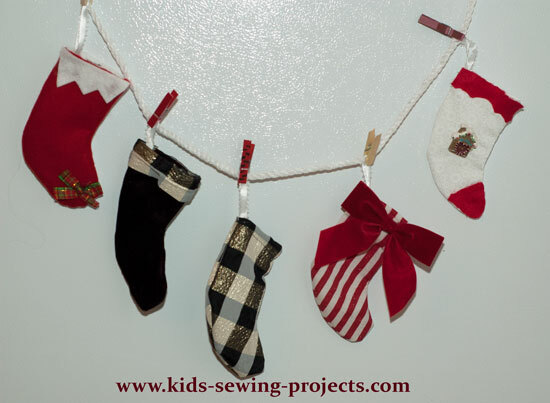 If you want to know how to sew Christmas stockings that are larger, make your pattern bigger or use an old stocking for your pattern. 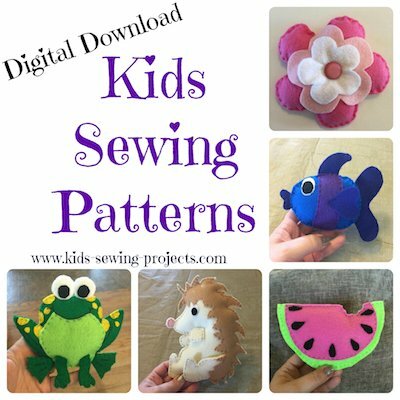 Lay your pattern out on the material desired, follow the sewing instructions below and decorate as you'd like. Place two stockings right sides together. Sew around edges leaving top open. Turn edge ½ inch down and hem in place. Turn right side out. Cut a strip of ribbon and pin in place. 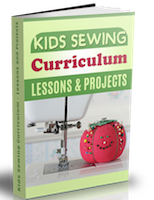 Sew to make a ribbon loop for hanging. 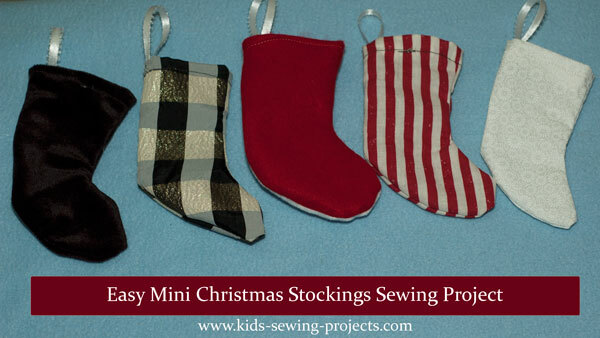 Now your mini stockings are sewn and you are ready to decorate. Decorate with pom poms, jingle bells, ribbon, buttons, whatever embellishments you can find or want to use. Use these as tree decorations or fill with little presents. Make a garland of stockings by using 4 or 5 mini stockings and attaching them to a ribbon. 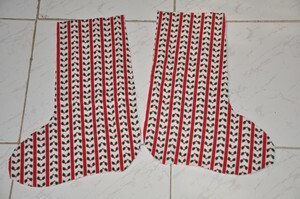 ~Now that you've practiced with smaller stockings it is easy to sew Christmas stockings of any size. 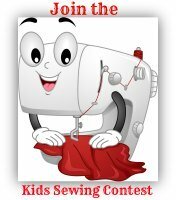 Our school sewing club started in September 2010 with 14 children, all aged 7, attending for one hour per week. We made this simple project for Christmas. 1. 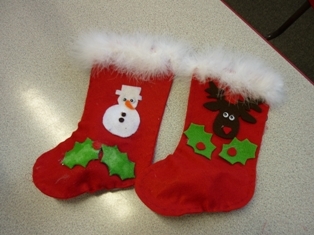 Using a template we cut out two stocking shapes from good quality felt and pinned them together. 2.I had previously cut out various Christmasy shapes for the children(very fiddly and time consuming)and they glued them on to the front of their stocking and decorated them as they wanted. 3. 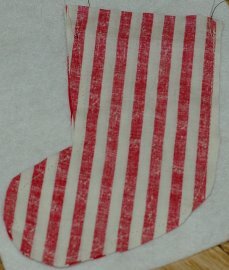 Then they sewed up all around the sides of the stocking using running or back stitch. 4. We then tacked a strip of white fluff around the top. Very effective but it did get up your nose and made you itch!! 5. Last thing - fill with sweets and small prezzies and send home with delighted children. 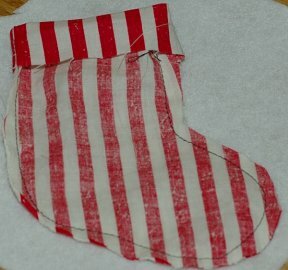 On to ideas of gifts to sew from Sew an Easy Christmas Stocking.